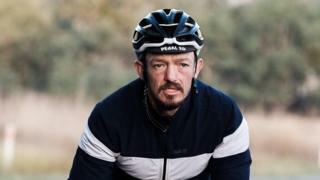 The death of champion British cyclist Mike Hall in a road race in Australia was "avoidable", a coroner has found. Mr Hall, 35, died almost instantly when he was hit by a car on a highway near Canberra in 2017. One of the world's best ultra-endurance cyclists, he had been riding in the Indian Pacific Wheel Race at the time. A coroner noted the accident happened in the dark and said it should prompt a thorough review of local road and bicycle laws. "Mr Hall's death was avoidable, which makes the loss of this remarkable person even more keenly felt by his family and the community," Dr Bernadette Boss said on Thursday. The inquest had heard that the coast-to-coast race - in which cyclists ride a 5,500km (3,400 miles) route from Fremantle to Sydney - was known for its difficulty. Mr Hall, from Harrogate, North Yorkshire, had been in second place when he was hit by a car travelling at 100km/h (62 mph) at 06.22 local time on 31 March. He suffered fatal head, spinal and abdominal injuries, the inquest heard. Dr Boss noted that the driver, Shegu Bobb, had reported not seeing Mr Hall in the darkness. She said Mr Hall had been wearing dark clothing, but that she could not determine whether he was wearing adequate reflective material. Dr Boss said the investigation was "to some degree compromised by the loss of significant evidence" because police had not retained all of Mr Hall's clothing and bicycle equipment. No charges have been laid against Mr Bobb, who had been on his way to work at the time of the accident. He initially thought he had struck a kangaroo, the inquest heard. Police testified that Mr Bobb had been distracted by a parked car as he turned on to the highway, and had no time to avoid the collision. Dr Boss said the incident should provide a "catalyst" for better safety rules, making six recommendations - including calling for a review of local road intersections. She also recommended that Australia consider making it mandatory for all cyclists to have flashing rear lights when riding at night. Mr Hall won the 2012 World Cycle Race and had been living in Monmouthshire, South Wales. His death shocked the sport and prompted memorial rides in Australia and the UK. It also led to a suspension of the annual event.